Autumn was exploding. On a sunny, brisk October morning in the late 1980s, I stood in Labrador Hollow, a nature preserve south of Syracuse. I looked all around, threw my arms open, tossed my head back, closed my eyes. I breathed in and soaked up deep blue sky, bright red leaves and that early chill so fresh on my skin. And at the same time, I was vaporizing, disappearing into the beauty. Mutual osmosis. It was never more clear that the universe is in all of us just as we are all part of the universe. And by "we" I mean everyone and every thing: every leaf, twig, rock, rabbit. That epiphany, that transcendence, informs my work more than anything. I want to study my subject, get under it, go inside and through it, know it. 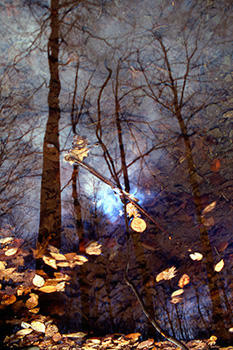 Whether I'm photographing a waterfall, a water abstraction, a winter landscape or a window shade, a relationship emerges. I absorb the beauty and the beauty absorbs me. I lose myself and find myself again. This image, called Labrador Hollow, embodies my experience there.